Rudolf Virchow was an emient German pathologist and politician, who is widely regarded as one of the greatest and most influential physicians in history. One of the founding fathers of “social medicine”, Virchow developed the concept of pathological processes, and by drawing influence from the cell theory, analyzed the effects of disease in various organs and tissues of the human body. Rudolf Virchow was born in 1821 to a modest farming family. Virchow proved to be a very bright student, and received a free scholarship for medical training in Berlin. He started his medical studies in 1839, earning his M.D. degree in 1843. 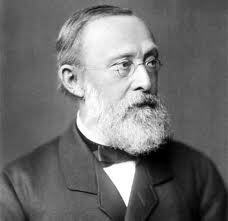 The world owes the understanding of the cellular basis for many diseases, such as cancer, to Rudolf Virchow. Particularly passionate about pathological histology, the science of diseased cells and tissues, he published a scientific paper in 1845, that discussed the oldest known pathological descriptions of leukemia. Virchow was also an fervid social reformer. When he was selected to look into a terrible outbreak of typhus fever in Germany, his report highlighted social conditions and blamed the government for the state of affairs that caused the outbreak. He concluded that improper system of sewers, deficiency of clean drinking water and unhygienic conditions led to the spread of the disease. As a consequence, Virchow was suspended for two weeks and he also faced degradation. Virchow, however, stood still in his reform efforts, and carried out on with his scientific research. An entire pathological institute was established for Virchow at the University of Berlin, where he worked for the rest of his career. He discovered that outside stimuli affected cells, and that diseased cells arise from already diseased and cancerous cells. He focused on clinical observation, physiological experiments and pathological anatomy, occasionally using laboratory animals, operating at the microscopic level. Virchow published probably his most influential work, “Cellular Pathology”, reporting that the cell was the most fundamnetal unit of disease pathologies, including that of cancer. Rudolf Virchow was appointed a foreign member of the Royal Swedish Academy of Sciences in 1861. He was honored with the Copley Medal in 1892. Virchow died of heart failure in Berlin on September 5, 1902. He was 80 years old.